Casey Flaherty is an attorney originally from Los Angeles but now based in Austin, TX. He started his career as an associate at Holland & Knight Law Firm and then moved to be in-house counsel at Kia Motors. After four years at Kia, he recently started consulting on his own, focusing on empirically based approaches to legal quality and legal spend management for in-house departments. Flaherty is well-known for creating the Legal Technology Audit (LTA), a test of basic technological proficiency for lawyers and in-house corporate departments. 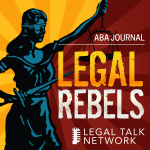 A discussion on lawyer proficiency with currently available technology and the often overlooked skills gap present within the legal industry.